When my friend and her husband decided to pull up their Midwestern roots and move their two small children to Connecticut, I knew she had a huge challenge ahead of her. I made her these socks, so that even from hundreds of miles away, I could give her some comfort on those days when the toddler decides to color his bedroom walls while the baby screams at the top of her lungs. Handmade socks can make anything better. 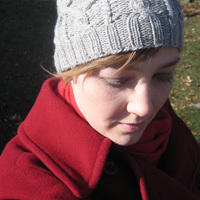 The design alternates diamonds with cable decorations and ones with a plain purl background. The final result is reminiscent of ornate cathedrals, thus the name. Schaefer Yarn Company Anne [60% merino wool, 25% mohair, 15% nylon; 560 yd/512 m per skein]; color: Julia Child; 1 skein. Note: In Rounds 15 and 23 the final cable runs one stitch into the following round. Depending on how your stitches are distributed, you will likely want to shuffle a stitch from the start of the first needle of the round to the end of the last needle to make this easier. Round 1: [P1, k1, p1, k2] 14 [16, 18] times. Round 2: [P1, k1, p1, k2] 14 [16, 18] times. Round 3: [P1, k1, p1, C2F] 14 [16, 18] times. Round 4: [P1, k1, p1, k2] 14 [16, 18] times. Round 5: [P1, k1, p1, k2] 14 [16, 18] times. Round 6: [P1, k1, p1, k2] 14 [16, 18] times. Round 7: [P1, k1, p1, k2] 14 [16, 18] times. Round 8: [P1, k1, p1, k2] 14 [16, 18] times. Round 9: [P1, k1, C2PB, C2PF, k1, p1, k2] 7 [8, 9] times. Round 10: [P1, k2, p2, k2, p1, k2] 7 [8, 9] times. Round 11: [P1, C2PB, p2, C2PF, p1, C2F] 7 [8, 9] times. Round 12: [P1, k1, p4, k1, p1, k2] 7 [8, 9] times. Round 13: [C2PB, p4, C2PF, k2] 7 [8, 9] times. Round 14: [K1, p6, k3] 7 [8, 9] times. Round 15: K1, [p6, C2PF, C2PB] 7 [8, 9] times. Note: the last cable overlaps the first stitch of Round 16. Round 16: P7 k2 [p8, k2] 6 [7, 8] times. Round 17: [P8, C2F] 7 [8, 9] times. Round 18: [P8, k2] 7 [8, 9] times. Round 19: [P8, k2] 7 [8, 9] times. Round 20: [P8, k2] 7 [8, 9] times. Round 21: [P8, C2F] 7 [8, 9] times. Round 22: [P8, k2] 7 [8, 9] times. Round 23: P1, [p6, C2B, C2F] – 7 [8, 9] times. Note: the last cable overlaps the first stitch of Round 24. Round 24: P7, k2 [p8, k2] 6 [7, 8] times. Round 26: [P1, k1, p4, k1, p1, k2] 7 [8, 9] times. Round 28: [P1, k2, p2, k2, p1, k2] 7 [8, 9] times. Round 30: [P1, k1, p1, k2] 14 [16, 18] times. Round 32: [P1, k1, p1, k2] 14 [16, 18] times. Round 1: K2, [p1, k1, p1, k2] 6 [8, 8] times. Round 2: K2, [p1, k1, p1, k2] 6 [8, 8] times. Round 3: C2F, [p1, k1, p1, C2F] 6 [8, 8] times. Round 4: K2, [p1, k1, p1, k2] 6 [8, 8] times. Round 5: K2, [p1, k1, p1, k2] 6 [8, 8] times. Round 6: K2, [p1, k1, p1, k2] 6 [8, 8] times. Round 7: C2F, [p1, k1, p1, C2F] 6 [8, 8] times. Round 8: K2, [p1, k1, p1, k2] 6 [8, 8] times. Round 9: K2, [p1, k1, C2PB, C2PF, k1, p1, k2] 3 [3, 4] times. Round 10: K2, [p1, k2, p2, k2, p1, k2] 3 [3, 4] times. Round 11: C2F, [p1, C2PB, p2, C2PF, p1, C2F] 3 [3, 4] times. Round 12: K2, [p1, k1, p4, k1, p1, k2] 3 [3, 4] times. Round 13: K2, [C2PB, p4, C2PF, k2] 3 [3, 4] times. Round 14: K2, [k1, p6, k3] 3 [3, 4] times. Round 15: K1, [C2PB, p6, C2PF] 3 [4, 4] times, k1. Round 16: K2, [p8, k2] 3 [3, 4] times. Round 17: C2F, [p1, k1, p1, C2F] 6 [8, 8] times. Round 18: K2, [p8, k2] 3 [3, 4] times. Round 19: K2, [p8, k2] 3 [3, 4] times. Round 20: K2, [p8, k2] 3 [3, 4] times. Round 21: C2F, [p1, k1, p1, C2F] 6 [8, 8] times. Round 22: [P8, k2] 2 [3, 3] times. Round 23: K1 [C2PF, p6, C2PB] 3 [4, 4] times, k1. Round 24: K2 [k1, p6, k3] 3 [3, 4] times. Round 25: K2 [C2PF, p4, C2PB, k2] 3 [3, 4] times. Round 26: K2 [P1, k1, p4, k1, p1, k2] 3 [3, 4] times. Round 27: C2F [P1, C2F, p2, C2B, p1, C2F] 3 [3, 4] times. Round 28: K2 [P1, k2, p2, k2, p1, k2] 3 [3, 4] times. Round 29: K2 [P1, k1, C2PF, C2PB, k1, p1, k2] 3 [3, 4] times. Round 30: K2 [P1, k1, p1, k2] 6 [8, 8] times. Round 32: K2 [P1, k1, p1, k2] 6 [8, 8] times. Chart: Click for the charts; they will print on one letter-sized page. Cast on 56 [64, 72]. Distribute evenly across your needles and join for working in the round, being careful not to twist. Place marker if desired. Ribbing round: [P1, k1] across round. Work as established until ribbing measures 1 inch. Increase round: [P1, k1, p1, k1, m1] 14 [16, 18] times. 70 [80, 90] stitches total. Work 2 full repeats of the Cathedral Cable pattern. Next row, set up for heel flap [RS]: Sl1, [k1, p1, k2, p1] 7 [7, 9] times, k1, p1, turn. 38 [38, 48] sts. 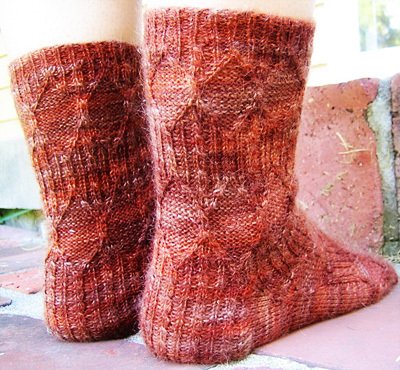 Place remaining [32, 42, 42] sts on a holder if desired – you will return to these once the heel is completed. Heel flap row 2 [WS]: Sl1, [p1, k1, p2, k1] 7 [7, 9] times, p2. Heel flap row 3 [RS]: Sl1, [k1, p1, C2F, p1] 7 [7, 9] times, k1, p1. Heel flap row 4 [WS]: Sl1, [p1, k1, p2, k1] 7 [7, 9] times, p2. Heel flap row 5 [RS]:Sl1, [k1, p1, k2, p1] 7 [7, 9] times, k1, p1. Heel flap row 6 [WS]: Sl1, [p1, k1, p2, k1] 7 [7, 9] times, p2. Repeat Rows 3-6 until heel flap measures 2.5 [2.75, 3] inches, ending with a WS row. 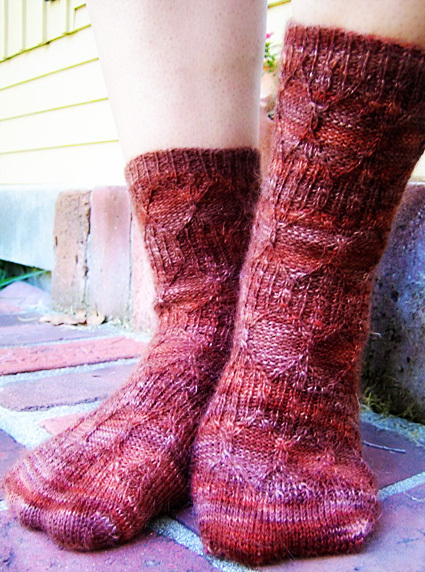 Heel turn row 1 [RS]: Sl1, k19 [19, 25], SSK, k1, turn. Heel turn row 2 [WS]: Sl1, p3 [3, 5], p2tog, p1, turn. 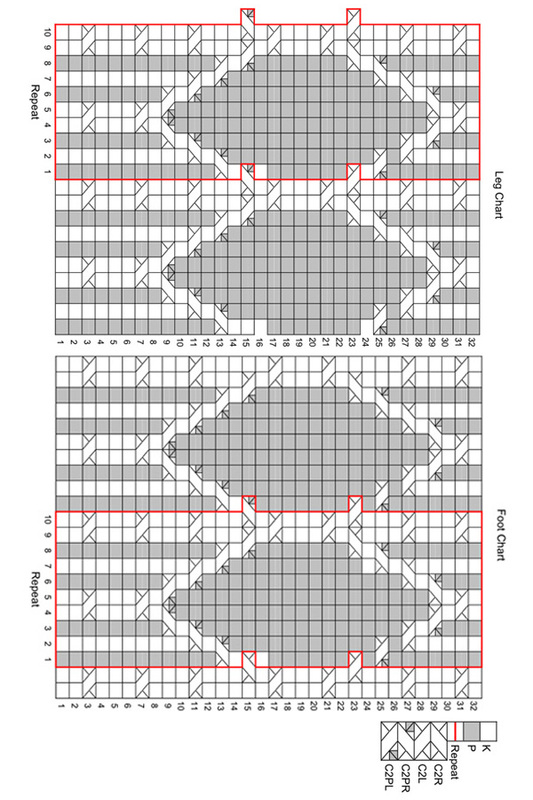 Heel turn row 4 [WS]: Sl1, p5 [5, 7], p2tog, p1, turn. Heel turn row 6 [WS]: Sl1, p7 [7, 9], p2tog, p1, turn. Heel turn row 8 [WS]: Sl1, p9 [9, 11], p2tog, p1, turn. Heel turn row 10 [WS]: Sl1, p11 [11 13], p2tog, p1, turn. Heel turn row 12 [WS]: Sl1, p13 [13, 15], p2tog, p1, turn. Heel turn row 14 [WS]: Sl1, p15 [15, 17], p2tog, p1, turn. Heel turn row 16 [WS]: Sl1, p17 [17, 19], p2tog, p1, turn. Sizes Women’s S/M and Women’s M/L, proceed to Gusset. Heel turn row 18 [WS]: Sl1, p- [-, 21], p2tog, p1, turn. Heel turn row 20 [WS]: Sl1, p- [-, 23], p2tog, p1, turn. Heel turn row 22 [WS]: Sl1, p- [-, 24], p2tog, turn. 20 [20, 26] heel stitches remain. K 10 [10, 13]. Place marker for start of round. Gusset setup round: K10 [10, 13]. Pick up 15 [16, 17] sts along the edge of the heel flap. Place a second marker to denote start of instep sts. [K2, p1, k1, p1] 6 [8, 8] times, k2. This is the first round of the foot chart. Place a third marker to denote end of instep sts. Pick up 15 [16, 17] sts along the edge of the heel flap between the instep and the heel. K to end of round. 82 [94, 102] sts. 32 [42, 42] for instep, and 50 [52, 60] on the sole. Gusset decrease round: K to 3 sts before second marker, SSK, work instep sts as per Foot chart to third marker, slip marker, k1, k2tog, k to end of round. Even round: Work in established pattern, continuing to follow the Foot chart for the instep sts. Continue working the Foot chart, alternating decrease and even rounds until 70 [80 90] sts remain. Work in pattern as established until sock measures 2 inches less than full foot length from back of heel. Remove existing markers on the final round. Setup for toe: K17 [22, 27], pm, k33 [38, 43], pm, k2, pm, k33 [38, 43], pm, k1. Toe decrease round: K1, slip marker, SSK, k to 2 stitches before second marker, k2tog, slip marker, k2, slip marker, SSK, knit to 2 stitches before fourth marker, k2tog, slip marker, k1. Alternate decrease and even rounds until toe measures 2 inches. You should have 22 [32, 42] sts left. 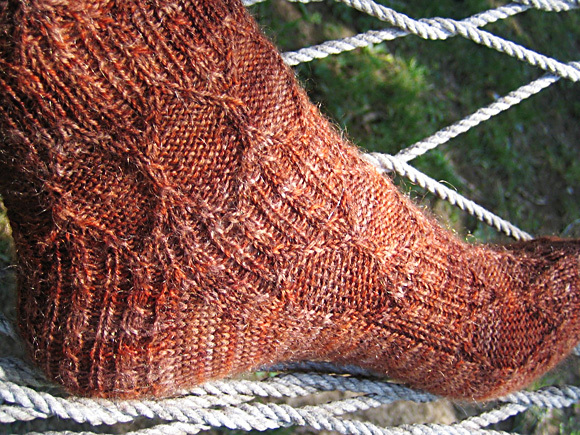 Close the toe with Kitchener stitch. Weave in ends and block, if desired. Shana Kreikemeier lives in Kansas City with her quirky dachshund, Pico. She makes a living by helping people find beauty schools, and she makes a life out of fabric and yarn.